During infection with the helminth parasite Schistosoma mansoni, the deposition of eggs coincides with the onset of IL-4 production and Th2 development. Although IL-4 is known as a potent inducer of Th2 differentiation, the mechanism by which schistosome eggs induce IL-4 production is not clear. In this study, we demonstrate that the S. mansoni egg Ag (SmEA) induces IgE-dependent IL-4 production by basophils derived from Heligmosomoides polygyrus-infected or OVA/alum-immunized mice in the absence of pathogen-specific IgE. The effect is mediated by the secretory glycoprotein IPSE/alpha-1, because IPSE/alpha-1-depleted SmEA no longer induces cytokine production. Conversely, recombinant IPSE/alpha-1 is sufficient to induce IL-4 production. Importantly, the injection of SmEA or recombinant IPSE/alpha-1 into H. polygyrus-infected 4get/KN2 IL-4 reporter mice rapidly induces the dose-dependent IL-4 production by basophils in the liver, a major site of egg deposition. Thus, IPSE/alpha-1 induces basophils to produce IL-4 even in the absence of Ag-specific IgE. Schistosoma mansoni is a helminth parasite that chronically infects men and mice. The infection is acquired during exposure to fresh water cercariae, which burrow through the skin (1). The course of infection in both host species is characterized by an early, moderate Th1 phase followed by a vigorous Th2 response during the acute stage (1). Failure to initiate a Th2 response is in both species associated with high-pathology schistosomiasis (2). In fact, IL-4−/− mice succumb to infection with S. mansoni and even the selective deletion of the IL-4Rα in macrophages is detrimental (3, 4). These findings underscore the importance of IL-4 and Th2 immunity for the host and consequently for the survival and propagation of the parasite. The onset of IL-4 production weeks after infection coincides with the deposition of S. mansoni eggs in the liver, and schistosome eggs alone are sufficient to induce Th2 responses in naive mice (1). Although IL-4 is known as a potent inducer of Th2 differentiation, the mechanisms by which S. mansoni eggs and their soluble Ags (SmEA)4 induce IL-4 production and Th2 development are still elusive. Recently we identified a glycoprotein secreted by S. mansoni eggs, IPSE/alpha-1, as a factor triggering basophils from nonsensitized humans to release IL-4 in vitro when costimulated with IL-3 (5, 6). However, it is not known whether this activity of IPSE/alpha-1 is limited to human basophils and whether basophils can be activated in vivo. In this study we use 4get/KN2 IL-4 dual-reporter mice (7) in which IL-4-competent cells are GFP+ and IL-4-producing cells additionally express huCD2 to obtain highly purified basophils and visualize IL-4 production directly in vivo. We show that IPSE/alpha-1 is necessary and sufficient to induce IL-4 production by murine basophils in an IgE-dependent, Ag-independent manner. Importantly, we demonstrate that SmEA and recombinant IPSE/alpha-1 induce hepatic basophils to produce IL-4 within hours of i.v. injection. Collectively, our data demonstrate that IPSE/alpha-1 induces IgE-dependent, Ag-independent IL-4 production by murine basophils in vivo, revealing an innate pathway that shows how basophils might direct Th2 development before the generation of Ag-specific IgE. 4get (C.129-Il4tm1Lky/J) (8) and 4get/KN2 (7) IL-4 reporter BALB/c mice were kept under specific pathogen-free conditions at the animal facility of the Trudeau Institute (Saranac Lake, NY) and were used at 8–14 wk of age. IgE−/− mice (9) and FVB wild-type (WT) controls were provided by Dr. F. Finkelman (University of Cincinnati, Cincinnati, OH). Animals were infected by gavage with 200 third-stage larvae of Heligmosomoides polygyrus (Hp) (7) or immunized i.p. with OVA (100 μg; Sigma-Aldrich) adsorbed to aluminum hydroxide (alum) and boosted 2 wk later. Crude Hp worm extracts (7), soluble SmEA, IPSE/alpha-1-depleted SmEA, and recombinant Escherichia coli-IPSE were prepared as described (6, 10). Human embryonic kidney (HEK)-IPSE was purified from human 293 HEK cells transfected with the expression vector pMSII-IPSE. Secreted HEK-IPSE (His-tagged) was sequentially purified from the culture medium by immobilized metal affinity chromatography and Ab affinity chromatography (H. Haas, manuscript in preparation). Hp-infected mice were injected i.v. with PBS, anti-IgE (2 μg), SmEA (50–500 μg), IPSE/alpha-1-depleted SmEA (500 μg), HEK-IPSE (2–18 μg), or with 50 μg of crude worm extracts and analyzed 4 h later (7). All experimental procedures involving mice were approved by the Institutional Animal Care and Use Committee at the Trudeau Institute. Single-cell suspensions from all tissues were prepared as described (7). FACS reagents were purchased from BD Biosciences, Caltag Laboratories, eBioscience, or R&D Systems. The following mAbs against mouse Ags were used as PE, allophycocyanin, or biotin conjugates: CCR3 (clone 83101), CD4 (clone RM4-5), CD8α (clone CT-CD8a), CD19 (clone 1D3), CD90.1 (clone HIS51), IgE (clone R35-72), NK1.1 (clone PK136), TCRβ (clone H57-597), and TCRγδ (clone GL3). Additional reagents included anti-human CD2 (clone RPA-2.10) and streptavidin-allophycocyanin. Dead cells were discriminated by propidium iodide (3 μg/ml; Sigma-Aldrich) and excluded from the analyses. Samples were acquired on a FACSCalibur (BD Biosciences) flow cytometer and analyzed using FlowJo (Tree Star) software. Basophils (GFP+CD4−CCR3− from 4get mice; Thy1.1dullTCRβ− or CD4−CD8α−CD19−CCR3−NK1.1−TCRγδ− from nonreporter mice) were sorted from the blood of 2 wk Hp-infected animals by using a FACSVantage cell sorter (BD Biosciences) (11). Basophils were cultured (1 × 106/ml) in triplicate overnight in complete RPMI 1640 (10% heat-inactivated FBS, 50 μM 2-ME, 2 mM l-glutamine, and 100 U/ml penicillin/streptomycin) at 37°C and 5% CO2 without stimulation or with anti-IgE (2 μg/ml), SmEA (50 μg/ml), IPSE-depleted SmEA (50 μg/ml), E. coli-IPSE (0.5 μg/ml), HEK-IPSE (0.5 μg/ml), worm extract (50 μg/ml), or IL-3 (30 ng/ml) plus IL-18 (30 ng/ml) as indicated (7, 11). IL-4 in culture supernatants was quantified by ELISA (7). Whole blood from 4get/KN2 mice (5 × 106/ml) was cultured for 4–6 h under the same conditions. Basophils are very rare in the blood of naive mice; however they are a prominent population in helminth-infected animals (7, 11). To test whether IPSE/alpha-1 induces the production of IL-4 by ex vivo isolated murine basophils, we induced basophilia by infecting mice with the gastrointestinal nematode H. polygyrus, abbreviated Hp throughout (7, 11, 12). Of note, primary Hp infection does not result in the production of IL-4 by hepatic or blood-borne basophils (Figs. 1⇓B; 2⇓, B and C; 3⇓B; 4⇓B; and 5⇓, A–C) (7, 11). Expression of the high affinity IgE receptor (FcεRI) is a hallmark of basophils, and in mice basophils are the only blood-borne FcεRI+ population (11, 13). However, anti-IgE staining, which is commonly used to identify and sort FcεRI+ cells, cross-links monomeric IgE bound to FcεRI, resulting in activation and cytokine production (7, 11). To avoid this problem we used 4get IL-4 reporter mice in which basophils are constitutively GFP+ and can be unambiguously identified as GFP+CD4−CCR3− cells, thereby avoiding the binding of Abs that might activate basophils (7, 11, 14). Sort-purified basophils (Fig. 1⇓A) were cultured either in the absence or presence of SmEA, IPSE/alpha-1-depleted SmEA, glycosylated recombinant IPSE/alpha-1 expressed in HEK cells (HEK-IPSE), nonglycosylated recombinant IPSE/alpha-1 expressed in E. coli (E. coli-IPSE), anti-IgE, or crude Hp worm extract (Hp Ag) (Fig. 1⇓B). As expected (11), unstimulated basophils did not produce IL-4 whereas anti-IgE or the addition of Hp Ag induced robust IL-4 production. SmEA and both the glycosylated and nonglycosylated forms of recombinant IPSE/alpha-1 also induced robust IL-4 production. 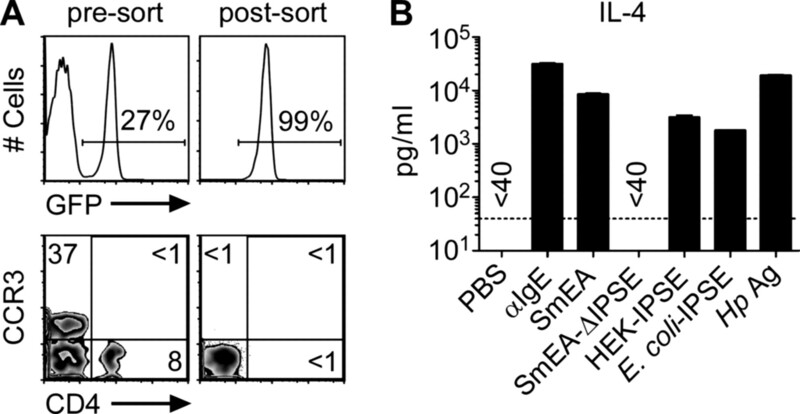 In striking contrast, no IL-4 was detected when SmEA was selectively depleted of IPSE/alpha-1 (Fig. 1⇓B). Thus, the IPSE/alpha-1 present in SmEA is a potent inducer of IL-4 production by murine basophils. IPSE/alpha-1 induces murine basophils to produce IL-4. A, 4get mice were infected with Hp and blood-borne basophils were sorted by FACS for GFP+CCR3−CD4− cells (i.e., basophils; see Materials and Methods for details). B, Highly purified basophils were cultured for 18 h in the presence of the indicated reagents and the supernatants were analyzed by ELISA for IL-4. The dotted line indicates the limit of detection. Data are representative of three independent experiments. Bars depict the mean ± SD from triplicate cultures. IPSE/alpha-1 selectively induces basophils to produce IL-4. A, 4get/KN2 mice were infected with Hp and 2 wk later unseparated blood cells were cultured in the presence of SmEA. Four to six hours later the cells were transferred onto ice, stained with the indicated mAb, and analyzed by FACS. B, As in A but the cells were cultured in the presence of the indicated reagents. FACS analyses were gated on FcεRI+ cells. C, As in A and B, but the indicated stimulants were preincubated for 30 min in the absence (−) or presence (+) of serum from Hp-infected mice before the addition of unseparated blood cells. Numbers in A indicate the frequency of cells in each quadrant, and in B and C they indicate the frequency of huCD2+ cells within the GFP+ population. PI− indicates propidium iodide negative (i.e., live) cells. Data are representative of at least two independent experiments. SmEA-induced IL-4 production by basophils is independent of infection, pronounced basophilia, or high FcεRI expression. 4get/KN2 mice were infected with Hp or immunized and boosted i.p. with OVA/alum. A, After 2 wk (Hp infection) or 4 wk (OVA/alum immunization), respectively, peripheral blood was analyzed by FACS. B, Unseparated cells from OVA/alum-immunized mice were cultured for 4 h in the presence of the indicated reagents. The cells were then transferred onto ice for subsequent Ab staining. FACS analyses in B were gated on FcεRI+ cells. Numbers indicate the frequency of huCD2+ cells within the GFP+ population. Data are representative of at least two independent experiments. 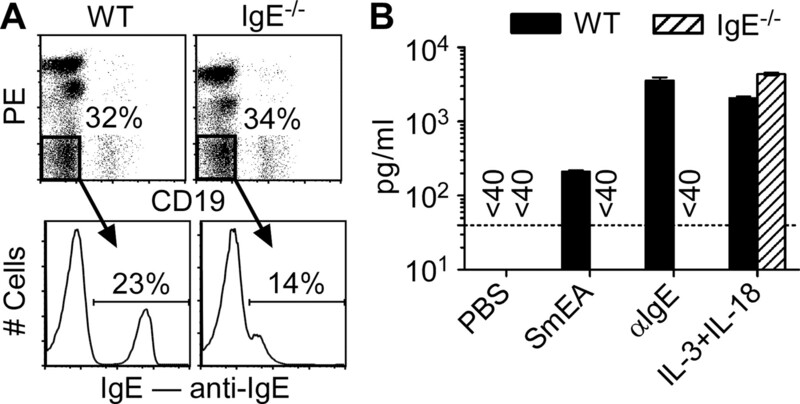 SmEA-induced IL-4 production by basophils is IgE dependent. A, FVB WT controls and IgE-deficient mice were infected with Hp. Blood was harvested 2 wk later and stained for CD19-FITC and CD4/CD8α/CCR3/NK1.1/TCRγδ-PE cells (top panels). Small aliquots were subsequently sensitized with IgE, stained with anti-IgE, and analyzed for FcεRI expression within the PE−/FITC− population (see gate) to assess the frequency of basophils (lower panel). B, FITC−/PE− cells (see gate in top panel of A) were sorted by FACS and cultured in the presence of the indicated reagents. The supernatants were harvested 18 h later and analyzed for IL-4 by ELISA. The dotted line indicates the limit of detection. Data are representative of two independent experiments. Bars depict the mean ± SD from triplicate cultures. 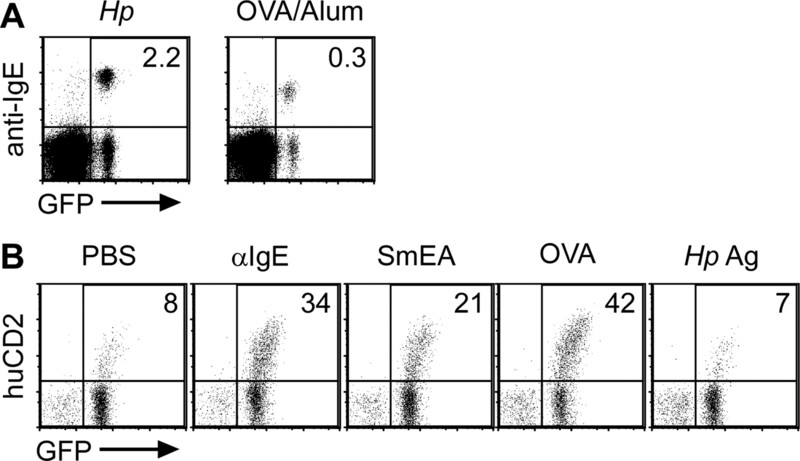 SmEA and IPSE/alpha-1 induce basophils to produce IL-4 in vivo. 4get/KN2 mice were infected with Hp. The animals were injected i.v. 2 wk later with the indicated reagents, and hepatic basophils (FcεRI+SSClow) were analyzed 4 h later by FACS. Numbers indicate the frequency of huCD2+ cells within the GFP+ population. Data are representative of two or more independent experiments. Although IPSE/alpha-1 clearly induces basophils to produce IL-4, we cannot exclude the possibility that other IL-4 competent cells, such as Th2 cells or eosinophils, also produce IL-4 in response to this stimulus. This issue was addressed by culturing whole blood cells from Hp-infected 4get/KN2 IL-4 dual-reporter mice in which IL-4-competent cells are GFP+ and IL-4-producing cells additionally express huCD2 (7). Whole blood containing Th2 cells and eosinophils in addition to basophils (7, 15) was taken 2 wk after Hp infection and cultured under the indicated conditions (Fig. 2⇑). As expected (Fig. 1⇑) (7), blood-borne cells from Hp-infected mice did not express huCD2 despite a high frequency of GFP+ cells (Fig. 2⇑B). SmEA induced huCD2 expression expectedly only in GFP+, IL-4-competent cells (Fig. 2⇑A), and only FcεRI+ cells (i.e., basophils) expressed huCD2 within the GFP+ population. Thus, the stimulation of murine blood selectively triggered basophils to produce IL-4. Next, we tested the effects of the same stimuli as used in Fig. 1⇑B on huCD2 expression by basophils ex vivo (Fig. 2⇑B). As expected (Figs. 1⇑ and 2⇑B) (7), unstimulated blood-borne basophils isolated from Hp-infected mice did not express huCD2. Stimulation with SmEA or recombinant IPSE/alpha-1, but not with IPSE/alpha-1-depleted SmEA, induced huCD2 expression. The expression of huCD2 qualitatively and quantitatively reflected IL-4 protein production by purified basophils (Fig. 1⇑B) and extended these observations to the single cell level. Soluble human IgE and IgG have been shown to bind IPSE/alpha-1 Ag nonspecifically, thereby competing out Fc receptor-bound Igs and suppressing the IL-4-inducing effect of IPSE/alpha-1 (6). To test whether polyclonal murine Igs bind IPSE/alpha-1, we preincubated SmEA, E. coli-IPSE, and Hp Ag with PBS or serum from Hp-infected mice before the addition of whole blood cells from Hp-infected 4get/KN2 mice (Fig. 2⇑C). Sera from mice infected with parasitic nematodes such as Hp contain high IgE and IgG1 concentrations (data not shown) (8, 12). 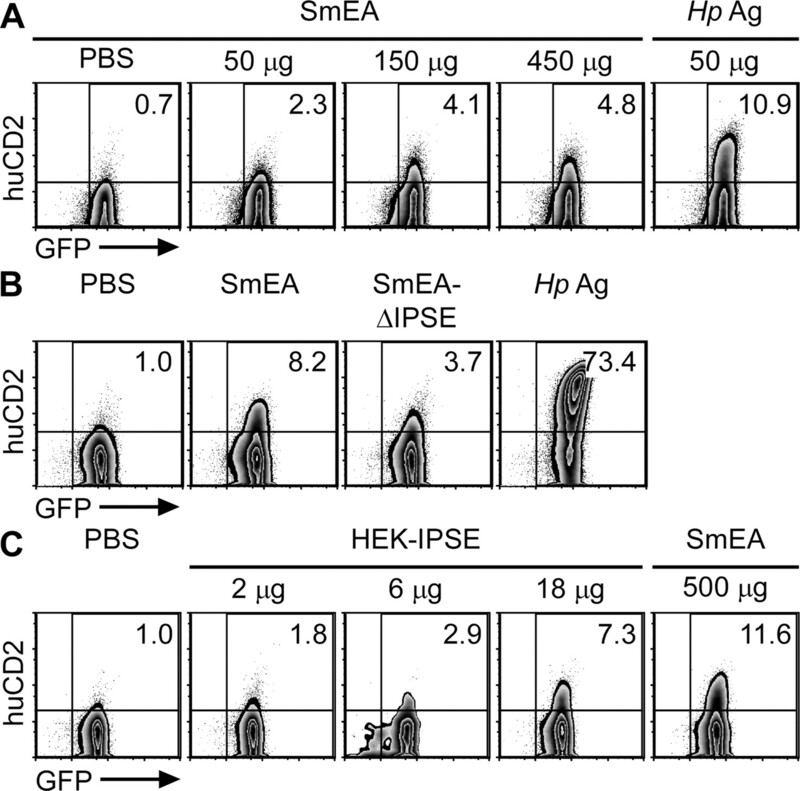 Indeed, the preincubation with Hp immune serum, which is not known to recognize SmEA, reduced not only the IL-4-inducing capacity of Hp Ag but also that of SmEA and E. coli-IPSE, suggesting that IPSE/alpha-1 binds Ag nonspecifically to murine Igs. Because infection with Hp might condition basophils to respond to SmEA, we next analyzed basophils isolated from OVA/alum-immunized mice. Although we have previously shown that Th2 cells from Hp-infected mice do not produce IL-4 in response to SmEA and vice versa (7), immunization with OVA/alum excludes the possibility of IgE Abs directed against common or cross-reactive Ags shared between S. mansoni and Hp. An OVA-specific IgE response was induced by immunizing 4get/KN2 mice with OVA/alum (Fig. 3⇑). Compared with Hp-infected mice, very few basophils were detected in the blood of OVA/alum-immunized animals (>80% fewer basophils) and lower FcεRI expression was apparent (Fig. 3⇑A). In contrast to Hp infection (Fig. 2⇑B), some huCD2 expression was detected on blood-borne basophils of OVA/alum-immunized animals, presumably due to the persistence of OVA Ag (Fig. 3⇑B). However, the addition of SmEA, anti-IgE, or OVA increased huCD2 expression, whereas Hp Ag had no effect. These data further demonstrate that SmEA-induced IL-4 production by basophils is not due to Ag-specific IgE and does not require any preexisting infection, extensive basophilia, or FcεRI up-regulation. Signaling through FcεRI triggers the effector functions of basophils in Th2 immunity and IgE-mediated responses (11, 13). Because IPSE/alpha-1 is an IgE-binding factor (6) we tested whether SmEA-induced basophil IL-4 production is IgE dependent. IgE−/− and FVB WT controls were infected with Hp and basophils were enriched from the blood. Of note, basophils cannot be sorted by anti-IgE staining because this results in activation and IL-4 production (7, 11). Thus, basophils were enriched either as Thy1.1dullTCRβ− cells (14) or by sorting for CD4−CD8−CD19−CCR3−NK1.1−TCRγδ− cells (Fig. 4⇑A). Importantly, both strategies eliminate all blood-borne potential IL-4 producers (i.e., CD4+ T cells, NK T cells, and eosinophils) except basophils (11), and basophils are the only population in the blood that produces IL-4 in response to SmEA (Fig. 2⇑). Basophils from WT mice produced IL-4 upon stimulation with SmEA or anti-IgE, whereas the same reagents induced no response in the corresponding IgE−/− cultures (Fig. 4⇑B). Importantly, upon basophil-specific stimulation with IL-3 plus IL-18 (7), IL-4 was detected in both cultures, demonstrating that IgE−/− basophils are capable of unimpaired IL-4 production. Thus, IPSE/alpha-1 induces basophils to produce IL-4 via a direct or indirect IgE-dependent mechanism. Last, we wanted to test the ability of IPSE/alpha-1 in SmEA to induce basophil IL-4 production in vivo. Hp-infected 4get/KN2 mice (7) were injected i.v. with PBS, graded doses of SmEA, or Hp Ag and the liver was analyzed 4 h later (Fig. 5⇑A). As published (7), hepatic basophils were huCD2− in PBS-injected, Hp-infected mice. In contrast, the injection of SmEA induced the dose-dependent expression of huCD2 on hepatic basophils. Because IPSE/alpha-1 is the only component in SmEA activating murine basophils in vitro (Figs. 1⇑ and 2⇑), we set out to test whether IPSE/alpha-1 is also responsible for SmEA-induced basophil IL-4 production in vivo. Hp-infected 4get/KN2 mice were injected with PBS, SmEA, or IPSE/alpha-1-depleted SmEA from the same batch, and the liver (Fig. 5⇑B) was analyzed 4 h later. Whereas native SmEA induced the expression of huCD2 on basophils, the same amount of IPSE/alpha-1-depleted SmEA induced consistently fewer basophils (<50%) to express huCD2 and the expression levels were consistently lower. Conversely, recombinant HEK-IPSE (Fig. 5⇑C) and E. coli-IPSE (data not shown) were sufficient to induce dose-dependent huCD2 expression. Although many studies have shown that basophils can be a source of IL-4 during acute infection or T cell-dependent memory responses, little is known about Ag-nonspecific innate responses (6, 14, 16, 17, 18). Collectively we demonstrate that S. mansoni IPSE/alpha-1 induces murine basophils in an IgE-dependent, Ag-independent manner to rapidly produce IL-4. The activity of IPSE/alpha-1 is not contingent on the preconditioning of basophils by preceding infections (Fig. 3⇑). Importantly, IL-4 production can be induced in basophils in the liver, a major site of S. mansoni egg deposition. Although the present study does not assess the effect of IPSE/alpha-1 and SmEA on Th2 differentiation, IL-4 is known as a key factor for Th2 development (8, 19). Of note, it has previously been demonstrated that T cell responses can be primed locally in the liver (20, 21). As we demonstrate in the present study, the IgE-dependent, Ag-nonspecific activation of basophils constitutes an innate mechanism for S. mansoni eggs to induce IL-4 production even before the generation of S. mansoni-specific IgE or any preexisting infection. Although basophils produce less IL-4 in response to Ag-nonspecific IPSE/alpha-1 stimulation as compared with Ag-specific stimulation, the innate release of IL-4 is likely to precede Th2 priming mediated by dendritic cells. Moreover, IL-4 increases the Ag-presenting and costimulatory potential of dendritic cells and is commonly used to mature bone marrow-derived dendritic cells (22). Therefore, early basophil-derived IL-4 can potentially foster Th2 development in two ways: directly as a factor inducing Th2 development, and indirectly by maturing dendritic cells for optimal Ag presentation and Th2 priming. These observations are consistent with a model whereby basophils-derived IL-4 might link innate responses to subsequent Th2 development (23, 24). It is tempting to speculate that other type 2-inducing pathogens have evolved to produce similar substances that innately activate basophils, thereby jump-starting IL-4 production and Th2 immunity. We thank Dr. F. Finkelman for providing IgE−/− mice and FVB WT controls, S. Monard and B. Sells for cell sorting, D. Duso for technical assistance, and Dr. F. Lund for critical review of the manuscript. ↵1 This work was supported by funds from the Trudeau Institute, National Institutes of Health Grants AI45666 (to M.M. ), AI072296 (to M.M. ), and AI32573 (to E.J.P. ), and the Deutsche Forschungsgemeinschaft Grants SFB/TRR22 (A12) and GRK 288 (to G.S. and H.H.). Schistosome life stages for these experiments were in part provided by the National Institutes of Allergy and Infectious Diseases Contract NO155270. ↵2 G.S. and K.M. contributed equally to this work. ↵4 Abbreviations used in this paper: SmEA, Schistosoma mansoni egg Ag; alum, aluminum hydroxide; HEK, human embryonic kidney; Hp, Heligmosomoides polygyrus; WT, wild type. Pearce, E. J., A. S. MacDonald. 2002. The immunobiology of schistosomiasis. Nat. Rev. Immunol. 2: 499-511. Stadecker, M. J., H. Asahi, E. Finger, H. J. Hernandez, L. I. Rutitzky, J. Sun. 2004. The immunobiology of Th1 polarization in high-pathology schistosomiasis. Immunol. Rev. 201: 168-179. Brunet, L. R., F. D. Finkelman, A. W. Cheever, M. A. Kopf, E. J. Pearce. 1997. IL-4 protects against TNF-α-mediated cachexia and death during acute schistosomiasis. J. Immunol. 159: 777-785. Herbert, D. R., C. Holscher, M. Mohrs, B. Arendse, A. Schwegmann, M. Radwanska, M. Leeto, R. Kirsch, P. Hall, H. Mossmann, et al 2004. Alternative macrophage activation is essential for survival during schistosomiasis and downmodulates T helper 1 responses and immunopathology. Immunity 20: 623-635. Schramm, G., A. Gronow, J. Knobloch, V. Wippersteg, C. G. Grevelding, J. Galle, H. Fuller, R. G. Stanley, P. L. Chiodini, H. Haas, M. J. Doenhoff. 2006. IPSE/alpha-1: a major immunogenic component secreted from Schistosoma mansoni eggs. Mol. Biochem. Parasitol. 147: 9-19. Schramm, G., F. H. Falcone, A. Gronow, K. Haisch, U. Mamat, M. J. Doenhoff, G. Oliveira, J. Galle, C. A. Dahinden, H. Haas. 2003. Molecular characterization of an interleukin-4-inducing factor from Schistosoma mansoni eggs. J. Biol. Chem. 278: 18384-18392. Mohrs, K., A. E. Wakil, N. Killeen, R. M. Locksley, M. Mohrs. 2005. A two-step process for cytokine production revealed by IL-4 dual-reporter mice. Immunity 23: 419-429. MacDonald, A. S., A. D. Straw, B. Bauman, E. J. Pearce. 2001. CD8− dendritic cell activation status plays an integral role in influencing Th2 response development. J. Immunol. 167: 1982-1988. Gessner, A., K. Mohrs, M. Mohrs. 2005. Mast cells, basophils, and eosinophils acquire constitutive IL-4 and IL-13 transcripts during lineage differentiation that are sufficient for rapid cytokine production. J. Immunol. 174: 1063-1072. Finkelman, F. D., T. Shea-Donohue, J. Goldhill, C. A. Sullivan, S. C. Morris, K. B. Madden, W. C. Gause, J. F. Urban, Jr. 1997. Cytokine regulation of host defense against parasitic gastrointestinal nematodes: lessons from studies with rodent models. Annu. Rev. Immunol. 15: 505-533. Kinet, J. P.. 1999. The high-affinity IgE receptor (Fc epsilon RI): from physiology to pathology. Annu. Rev. Immunol. 17: 931-972. Khodoun, M. V., T. Orekhova, C. Potter, S. Morris, F. D. Finkelman. 2004. Basophils initiate IL-4 production during a memory T-dependent response. J. Exp. Med. 200: 857-870. Min, B., M. Prout, J. Hu-Li, J. Zhu, D. Jankovic, E. S. Morgan, J. F. Urban, Jr, A. M. Dvorak, F. D. Finkelman, G. LeGros, W. E. Paul. 2004. Basophils produce IL-4 and accumulate in tissues after infection with a Th2-inducing parasite. J. Exp. Med. 200: 507-517. Genovese, A., G. Borgia, L. Bjorck, A. Petraroli, A. de Paulis, M. Piazza, G. Marone. 2003. Immunoglobulin superantigen protein L induces IL-4 and IL-13 secretion from human Fc epsilon RI+ cells through interaction with the κ light chains of IgE. J. Immunol. 170: 1854-1861. Murphy, K. M., S. L. Reiner. 2002. Decision making in the immune system: the lineage decisions of helper T cells. Nat. Rev. Immunol. 2: 933-944. Knolle, P. A., E. Schmitt, S. Jin, T. Germann, R. Duchmann, S. Hegenbarth, G. Gerken, A. W. Lohse. 1999. Induction of cytokine production in naive CD4+ T cells by antigen-presenting murine liver sinusoidal endothelial cells but failure to induce differentiation toward Th1 cells. Gastroenterology 116: 1428-1440. Klein, I., I. N. Crispe. 2006. Complete differentiation of CD8+ T cells activated locally within the transplanted liver. J. Exp. Med. 203: 437-447. Lutz, M. B., R. M. Suri, M. Niimi, A. L. Ogilvie, N. A. Kukutsch, S. Rossner, G. Schuler, J. M. Austyn. 2000. Immature dendritic cells generated with low doses of GM-CSF in the absence of IL-4 are maturation resistant and prolong allograft survival in vivo. Eur. J. Immunol. 30: 1813-1822. Falcone, F. H., D. Zillikens, B. F. Gibbs. 2006. The 21st century renaissance of the basophil? Current insights into its role in allergic responses and innate immunity. Exp. Dermatol. 15: 855-864. Min, B., G. Le Gros, W. E. Paul. 2006. Basophils: a potential liaison between innate and adaptive immunity. Allergol. Int. 55: 99-104.